Begin your path toward recovery at an alcohol or drug rehab facility in Georgia. The state has certified treatment and recovery programs to help you overcome the disease of addiction. Georgia treatment facilities can help you or your loved one overcome addiction and prepare for a life of sobriety. The Peach State is home to hundreds of alcohol and drug rehab facilities, self-help groups and organizations that can aid your recovery. The number of people treated for substance use disorders in Georgia remained stable between 2013 and 2014. Drug rehab facilities treated 44,478 in 2013 and 45,158 people in 2014. Alcohol addiction is the most common substance use disorder treated in the state of Georgia, followed by marijuana and cocaine. Looking for rehab in your area? Connect with us today and discover addiction treatment options near you. Alcohol and marijuana are the most common substances of abuse in Georgia, and cocaine and methamphetamine are the most common hard drugs in the state. But heroin and other illicit opioid use has been increasing in recent years, leading to a growing number of drug overdose deaths in the Peach State. The rate of drug overdose deaths in Georgia increased by 10.2 percent between 2013 and 2014 and by 6.7 percent between 2014 and 2015, according to the Centers for Disease Control and Prevention. Like other states, prescription opioid misuse has increased recently in Georgia. The rise has led to an increasing number of deadly opioid overdoses, according to the CDC. Deaths involving synthetic opioids other than methadone, such as tramadol and fentanyl, increased by nearly 65 percent between 2014 and 2015. Deaths from heroin increased almost 38 percent. Heroin deaths have dramatically increased in Georgia over the last five years, Vernon Keenan, director of the Georgia Bureau of Investigation, said at a 2015 summit in Atlanta. Today heroin users come from all backgrounds, including the affluent and well educated. People who have become addicted to painkillers are finding heroin is easily accessible and inexpensive. 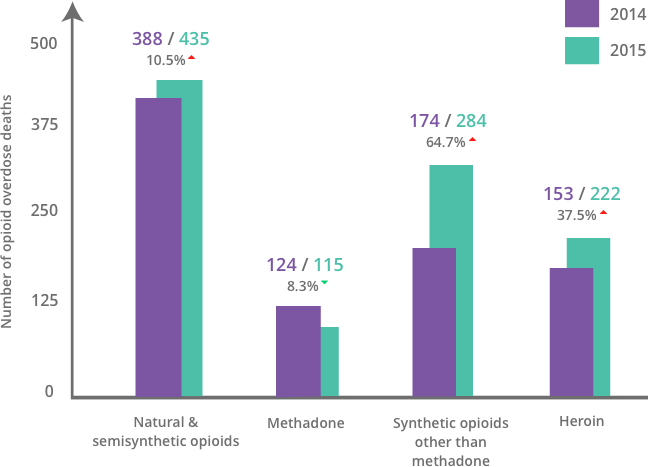 Deaths from natural opioids, such as morphine and codeine, and semisynthetic opioids, including oxycodone and hydrocodone, grew by 10 percent from 2014 to 2015, but methadone deaths decreased slightly. At the summit, Cobb County Deputy Chief Assistant District Attorney Jason Saliba said a new heroin trafficking organization was flooding the state with heroin. Alcohol, marijuana and electronic vapor products are the most commonly abused drugs by Georgia high schoolers, according to the 2015-16 Georgia Student Health Survey. Less than 3 percent of high school seniors said they used prescription painkillers, sedatives or stimulants without a prescription. Less than 1 percent said they used methamphetamines. 19% of high school seniors drank alcohol in the past 30 days. 10% of seniors drank five or more drinks in a row in that past 30 days. 6% of 12th graders smoked cigarettes in the past 30 days. 10% of seniors used an electronic vapor product in the past 30 days. 12% of seniors used marijuana in the past 30 days. Cities and communities across the state of Georgia are expanding access to addiction treatment and recovery resources. The state’s major cities are home to prevention and education initiatives in addition to sober living communities, self-help groups and other forms of support. Georgia supports several programs that connect residents with treatment facilities and recovery resources. The state also provides funding for several treatment programs. The Georgia Crisis and Access Line provides emergency mental health services for individuals in crisis. First responders will be sent to assess the situation, de-escalate the crisis and provide referral services. The line also provides referral services for a number of mental health issues, including substance use. HEPLINE Georgia offers free substance abuse crisis intervention and referral services for anyone in Georgia. Individuals with substance use issues or their friends, families or employers can call the help line to speak to a trained specialist and receive information on treatment, self-help groups, laws and other topics. Every person convicted of driving under the influence in Georgia must attend an educational risk-reduction program and receive a substance use assessment. If the assessment reveals a need for treatment, the person must complete a substance use treatment program approved by the state. The Georgia Department of Behavioral Health and Developmental Disabilities funds two intensive residential treatment programs for teens in Georgia. Located in Marietta and Keysville, the programs provide around-the-clock supervision for teens ages 13 to 17 who are in need of treatment for substance use disorders. The recovery journey does not end after a person completes a rehab program. Georgia continues to support individuals in recovery after treatment by providing safe places for them to live. The state of Georgia provides funding for nine adolescent clubhouses that support adolescents and their family members who are in recovery from addiction. The clubhouses host social and recreational activities, and they provide educational, employment and transitional services. The Georgia Association of Recovery Residences evaluates and monitors sober living environments and other recovery services in the state. The organization comprises more than 60 recovery residences that adhere to standards for safety, treatment and support. The Georgia Department of Behavioral Health and Developmental Disabilities supports a variety of substance abuse prevention initiatives. Numerous community organizations also work with the state to reduce problematic alcohol and drug use. The Georgia Council on Substance Abuse prevents the negative consequences of alcohol and drug use through a variety of efforts across the state. The council influences public policy on addiction treatment and recovery. It provides educational and training programs, and it disseminates information to relevant organizations. The Council on Alcohol and Drugs is a nonprofit that develops evidence-based programs to prevent substance abuse in workplaces, schools and communities. It’s an official affiliate of the Georgia Chamber of Commerce and is located in the chamber’s offices in Atlanta. Since 1993, the council has been the state’s official provider of drug-free workplace programs. In partnership with the Council on Alcohol and Drugs, the Drugs Don’t Work program assists businesses in creating drug-free work environments. Businesses can receive discounted drug-free workplace programming and educational materials to inform their employees. Run by the Council on Alcohol and Drugs, the Georgia Prescription Drug Abuse Prevention Collaborative reduces prescription drug abuse through educational and monitoring programs, proper disposal initiatives and law enforcement efforts. The state’s Alcohol Prevention Project uses epidemiological data to support evidence-based prevention programs. The goal is to prevent early alcohol use among minors and reduce binge drinking and heavy drinking among young adults. The Georgia Teen Institute is a statewide program run by Gwinnet United in Drug Education. GUIDE establishes youth action teams across Georgia, and it hosts an annual four-day camp at Oxford College to provide prevention workshops. The teams plan peer-based prevention programs at the camp, and they implement them in their communities. Funded by a federal Substance Abuse and Mental Health Services Administration grant, Gen Rx is a state program that strives to reduce prescription drug abuse among teens and young adults in high-risk counties, including Catoosa, Early and Gwinnett counties. The Maternal Substance Abuse and Child Development Project raises awareness about the harmful effects of alcohol and drug use during pregnancy. The project promotes awareness through media campaigns, and it offers training sessions on child development and substance abuse in communities across the state. Voices for Prevention collaborates with health providers, addiction professionals, prevention advocates and community organizations in Georgia to create a unified strategy to prevent alcohol and drug use. It researches and recommends policies to improve public health and educates the public on relevant issues. The Georgia School of Addiction Studies is an annual conference for law enforcement, prevention specialists, treatment providers, social workers, legal professionals and others involved in the treatment and rehabilitation of people with substance use disorders. The conference is a networking and professional development opportunity. Teens under the age of 18 are required to complete the Georgia Alcohol and Drug Awareness Program before receiving a driver’s license. The program is a four-hour course that is offered in high school or online. The Georgia Drugs and Narcotics Agency enforces the state’s Controlled Substances Act and Dangerous Drug Act. It works with the Georgia State Board of Pharmacy to develop and enforce the state’s pharmaceutical regulations, and it provides informational resources to the public. The Georgia Prevention Project originally focused on reducing methamphetamine use, but it expanded its programming to address a variety of illicit drugs. The organization implements statewide awareness campaigns and educational programs involving partners in communities across Georgia. Georgia Overdose Prevention is a volunteer organization composed of health professionals and community members who have been affected by deadly drug overdoses. The group was formed to advocate for the Georgia 911 Medical Amnesty Law, which provides legal immunity to people who call 911 to report someone experiencing an overdose. Today, Georgia Overdose Prevention helps implement the law by raising awareness. The Georgia Network for Substance Abuse Prevention in Higher Education, commonly referred to as the GA Network, organizes resources and support for evidence-based alcohol and drug programs on college campuses in the state. It provides a forum for institutions to collaborate, and it sets standards for alcohol and other drug programming. Self-help groups such as Alcoholics Anonymous and Narcotics Anonymous have helped hundreds of thousands of people overcome substance use issues. Georgia is home to hundreds of support group meetings every day. Find one near you.